Upon my exit I noticed something incredibly uncommon: I was not the only person across the street from the post office taking photos of the building! This was an intriguing turn of events. I had to ask why. And I'm glad I did, because during a weekend whereupon I visited 119 POs, I could well have overlooked a few facets of this design. As it turns out, an area gentlemen was taking his wife and two of their friends from China on an Art Deco architecture tour of central Pennsylvania -- everything from parks to post offices. This was a premier stop. Awesome. I was fortunate enough to be able to pick his brain to learn a few of the tidbits detailed in this entry. The building is also a stop along the official Milton walking tour. There are three information sites near the building (one in front, and two across the street from), from which you can read the town's, the block's, and the post office's history. Quotes in this article are taken from said. But, an information site across the street tells that it was built in 1934. Called for by the town as early as 1925, it took a very long time for the building to come together in its present form. Every detail that currently makes the building a standout had to be meticulously fought for by local officials who wanted to honor their town by building it a post office that was the grandest among its peers. The Post Office Department had not wanted to build Milton a new post office at all; several local civic leaders eventually won approval for the post office that they boasted would be "superior to that of any town in the country comparable in size to Milton". (The town's current population: 6,350.) I'll present below absolutely phenomenal architectural facets that were obtained only at insistence of said local leaders that do indeed make this a fantastic post office, as well as an architectural gem in its own right. Here's another view of the full office. See if you can pick out something unusual from beneath the windows. I asked the tour guide what they symbolized: It's the productivity of America, embodied in a field of stalks of wheat. There are agriculturally productive rural areas in this part of Pennsylvania. 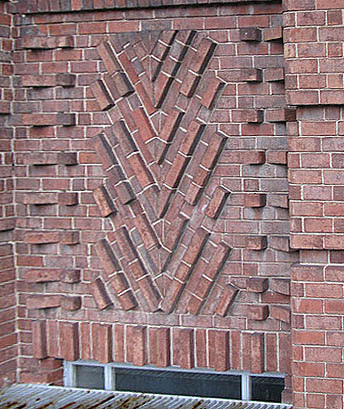 It's worth noting that, according to the information site across the road, "[architect] Henry Sternfield decided custom made bricks, a quarter inch larger in all dimensions, would be used" throughout the building. This was to be symbolic of the grandeur of the facility. The P.O. Department balked but quickly gave in to this first of three atypical design requests that would require ever more convincing. The third request [I'll return to #2], was rejected by the P.O. Department out of hand: The architect insisted that the history of mail service be carved in stone on the post office's parapet [just below the top]. There were to be five carved stones in all, to be done by a master carver in Philadelphia. 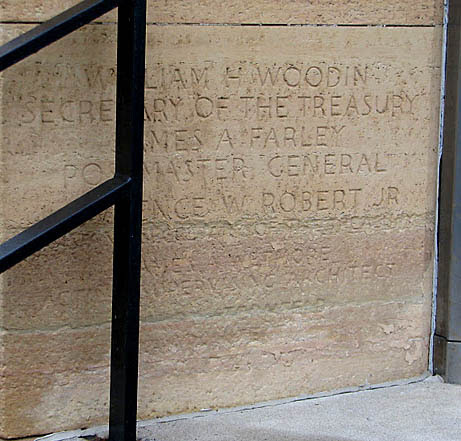 One of the local civic leaders, Walter Wilson, "personally paid for the custom carvings, which included the pony express, a truck, plane, locomotive, and ship." Sternfield's design called for a unique plaque to be placed over the entrance doors. Once again, after a special trip to Washington, negotiators got their way and the plaque was commissioned. It includes a map of Milton, the West Branch of the Susquehanna, [and] both islands, the great seal of the United States, the points of the compass, and two Indian beads. The words Milton, Pennsylvania, just over the revolving doorway and below the plaque, were not originally supposed to be there either. Again the Postal Department was talked into approving it. Is this a class act or what? This an exemplary example of what the Post Office meant to communities across America since before the dawn of the country. Compare the town of Milton's historical attitude to what we're being insisted upon by Washington is the social irrelevance of this American institution. Once again, the post office is a mark of local pride. So please (I'm looking at you, USPS Upper-Upper Management), stop stripping post offices away from the communities that want them and especially from those that truly need them. Stunning designs. This is the kind of work that once made America proud. Now we (usps) is about to throw it all away. The people who built these buildings must be rolling over in their graves. Thank you for showing us all that detail! Although I have been there, it was dusk when I was there, and I didn't see all the detail, and completely missed the history signs nearby. It's odd that I live in Milton, was an art student in college and continue to have an appreciation for art in all forms, and have never really paid any attention until now to the details and the beautiful work in this building. Wow! I've lived in Milton my whole life, and I never realized how special the Post Office is. Just something I took for granted! Thanks for the education!